Do you need a quality shipping tube solution for all of the important documents in your business? You can trust the durability of blueprint shipping tubes from PTS. These tubes are perfect for storing and mailing blueprints and other large sheets of paper that need to be protected from wrinkles or tearing. Our blueprint shipping tubes have high quality double wall tubes that are telescoped for varying lengths. Seamed metal closures insure these tubes can be used over and over. 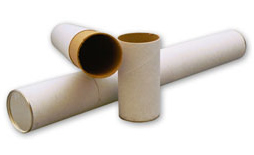 These Kraft tubes are specially designed for architectural drawings or banners. The blueprint tubes can also be used for your products as well. The inner sleeve floats to allow the tube to expand to fit your length needs. Double wall construction increases strength over simple mailing tubes and allows these tubes to be used over and over. Stock tubes are white Kraft outside. We can also design and manufacture custom blueprint tubes to sizes up to 6” in diameter and add color and printing. Paper Tubes & Sales has been in business since 1973 when we were founded on the ideals of creative excellence and quality customer service. As a family owned and operated company, it’s important to us that our customers always come first. We supply businesses in many different industries with quality paper tubes and paper cores to meet their unique needs. Today, PTS is one of the largest independent paper tube manufacturers in the US, and we’re proud of that. Our state-of-the-art equipment and amazing in-house engineering expertise allows us to quickly respond to your paper tube and paper core needs. Our quality is consistent, and our prices are competitive. PTS has its own fleet of trucks and offers nationwide distribution so that your business can order and receive the products that you need without any delay. Ordering paper tubes and paper cores has never been easier!